Dogs love to receive praise from their humans. A simple "good dog" can turn a dog into a wiggling, excited ball of energy. Dogs know when they're being praised for a job well done, and most will do just about anything to make their humans happy. Meeka the dog takes being a "good dog" very seriously. 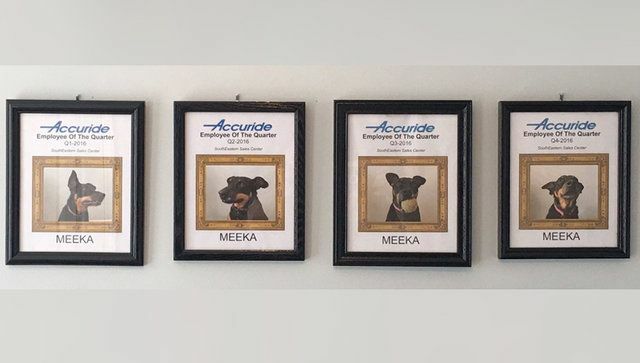 But unlike most other dogs, Meeka's received numerous awards attesting to what a good job she does each month. 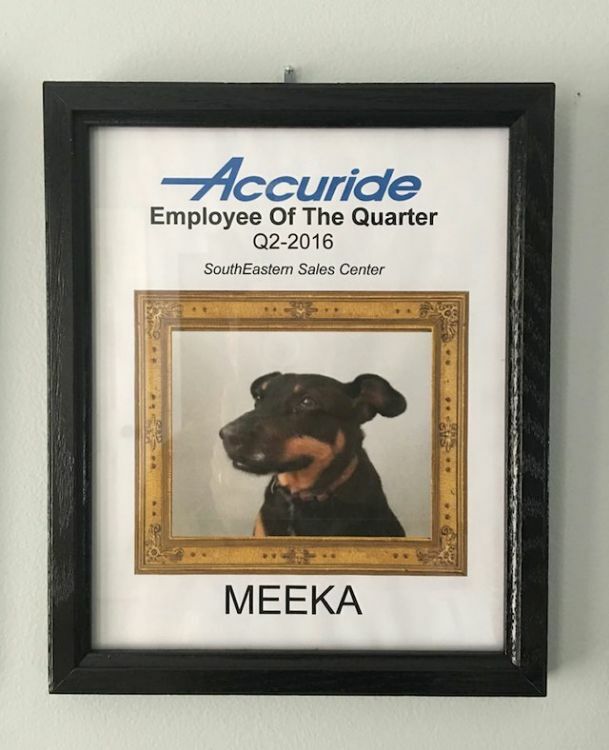 You see, Meeka's been deemed "Employee of the Quarter" again and again. 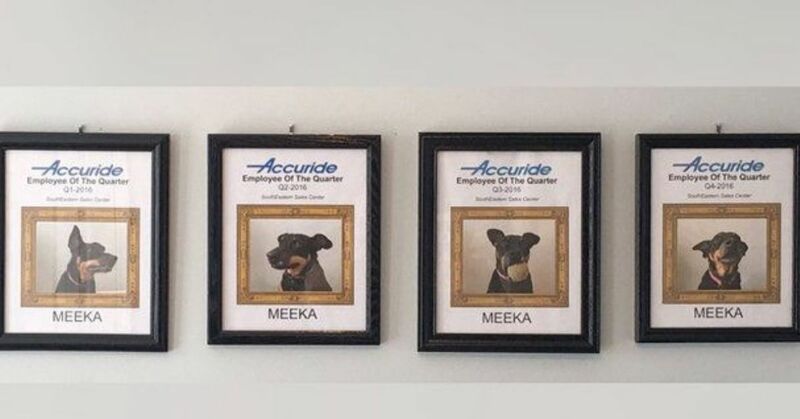 Meeka's dad, Michael Reeg, works for Accuride International Inc. Reed works from his home office, and Meeka and the family's other dog, Kya, are the only other two "employees" to staff that office. 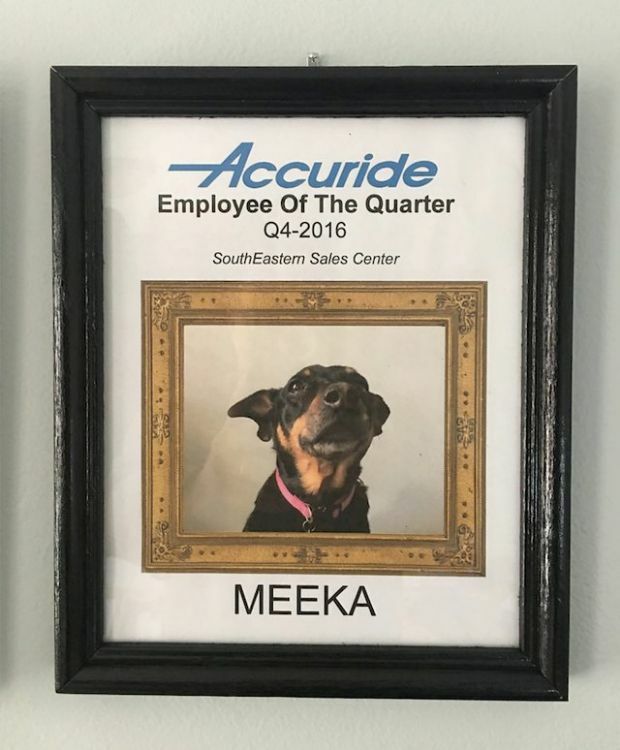 But when it comes to being a great employee, Meeka surpasses Kya in many ways. 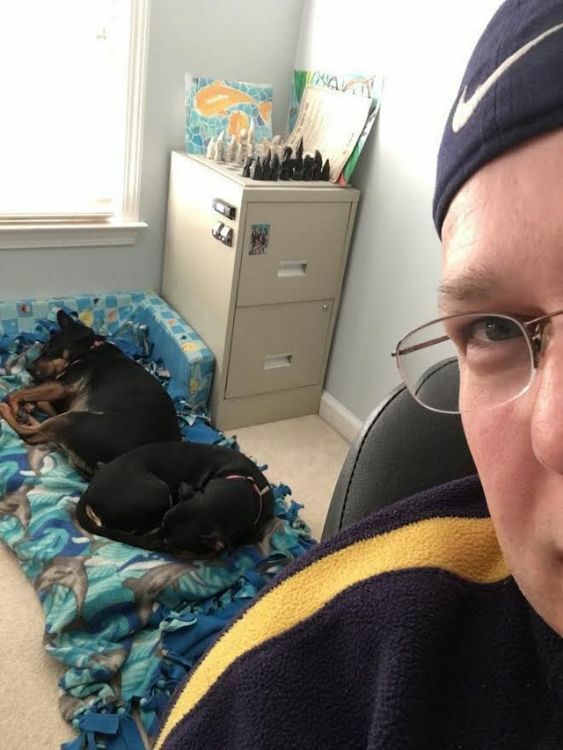 Reeg began working remotely a year ago and quickly discovered that his dogs were great coworkers. 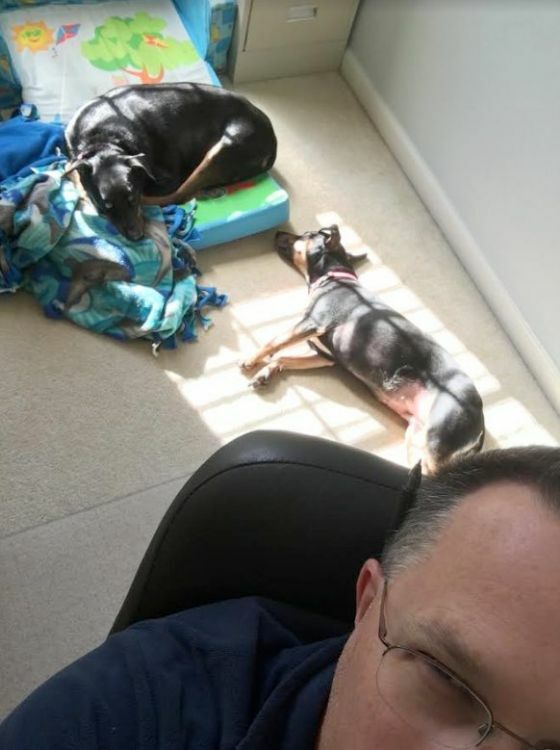 Though the dogs are quite unfamiliar with the work that Reeg does as district manager, they found different ways to help. 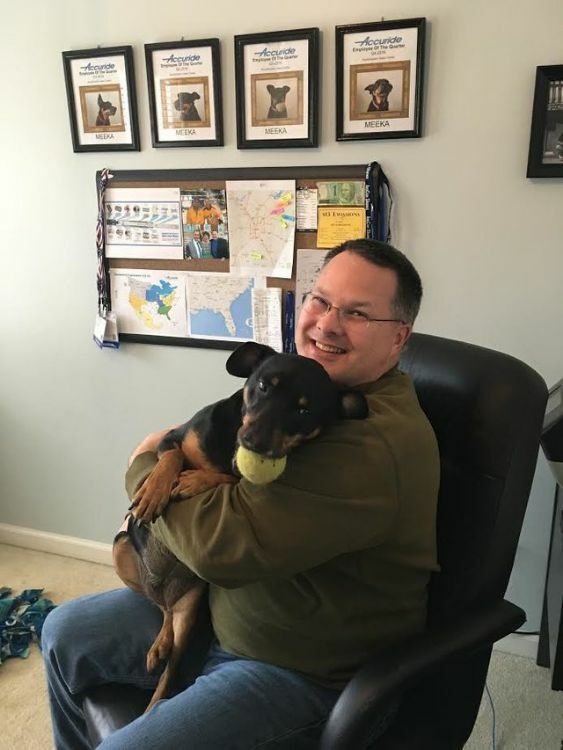 The transition into a work-from-home position meant that Reeg had to find a way to get himself motivated for work each day. The dogs alongside him in the office helped. Reeg sometimes talks to Meeka to work through business problems. He tries his sales pitches and presentations on the faithful dog, who always pays attention when Reeg is speaking. 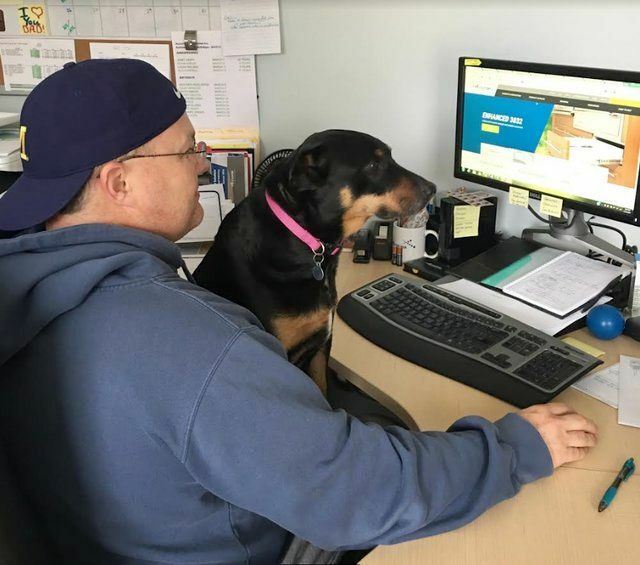 Meeka may not understand what her dad is saying, but she enjoys her days in the office. Meeka may work hard to be a great employee, but Kya isn't as engaged in the business. 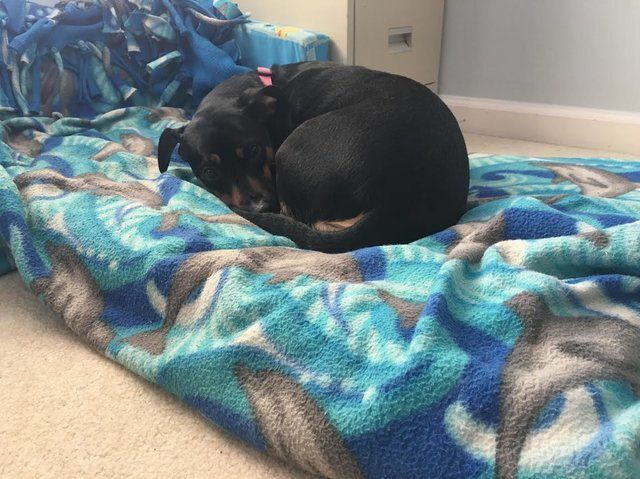 Kya is Reeg's wife's dog and is only interested in coming into the office when her mom isn't home. She's not quite as dedicated as Meeka. In fact, Meeka is so dedicated that she'll spend time in the office even when Reeg is on the road. If the office door is shut, Meeka will lie in front of it all day, just in case Reeg might actually be inside. It's that dedication that prompted Reeg to give Meeka the title of Employee of the Quarter. 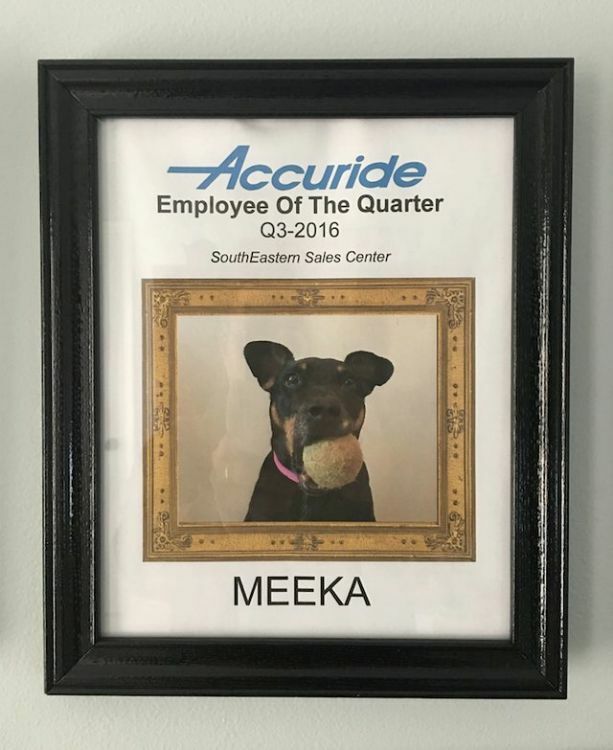 In early 2016, Reeg framed a photo of Meeka to serve as her award. Madison, Reeg's daughter, found the photo hilarious but wasn't all that surprised, considering Meeka's loyalty to the job. 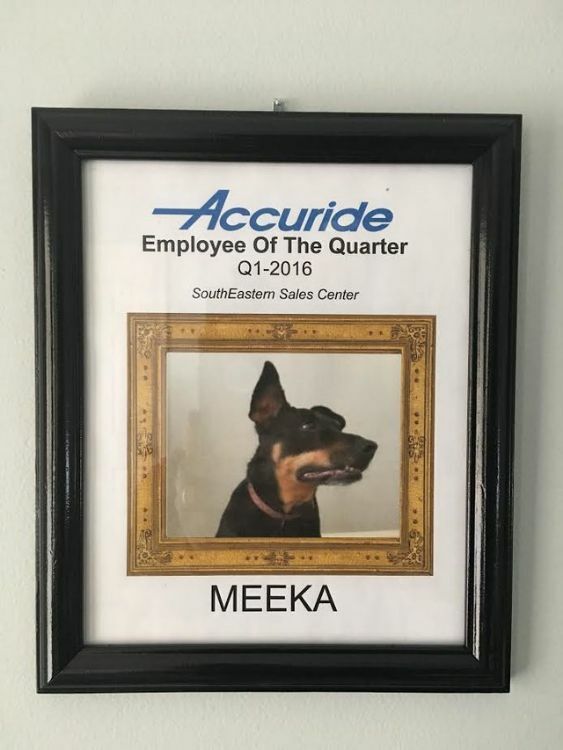 News of Meeka's stellar work performance has spread to the corporate office in California. Everyone agrees that this hard-working dog is deserving of her awards. Reeg sends in an update after each quarter, and Meeka's most certainly earned her titles. Though Meeka has performed wonderfully in the past, she's not a shoe-in for the award. Wanting Meeka to stay on her toes and a little worried that all of the praise might go to her head, Reed just might make Kya the Best Employee for a quarter or two. Who knows?